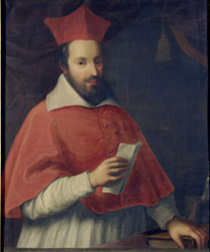 Ippolito II d' Este, Cardinal of Ferrara, son of the famous Lucrezia Borgia and Alfonso d' Este, was the inventor and the constructor of Villa d'Este. Born in 1509, he had a fast and splendid ecclesiastical and diplomatic career, which reached its top when from cardinal he was proclaimed Protector of France to the Court of Francesco I. During the Conclave of Giulio III, he was proclaimed Governor of Tivoli. He accepted the assignment, although the independent and rebellious nature of the Tiburtini rendered he not very desirable; but anyway, he considered this role as a springboard for his future. An other important reason convinced Ippolito II to accept this title: the existence of the ruins of numerous Roman Villas. Firstly, the one of Emperor Adrian, then those of Mecenate (today identified in the Sanctuary of Hercules Victor), and Quintilio Varo. These Villas allowed him to carry out interesting archaeological excavations: his passion. He took possession of his Office the 9th September 1550, while the guns of Rocca Pia greeted him and the most important citizens welcomed him enthusiastically. As a man accustomed with the pomp, the magnificence and the wealth of the Courts, he could not accept to live in a palace of Government obtained from an austere Convent of friars. Moreover, this does not agree with his plans. Then he decided to build a villa in the country, similar to the huge palace he was already building in Rome, in Monte Giordano. The two magnificent residences had to serve: one to give parties for his precious urban friends, the other to offer a pleasant rural stay that permitted longer and more comfortable talks. Ippolito II used to think slowly but he used to decide quickly, as the best of the best diplomats. In this way, Villa d'Este was born in a place called: "Valle Gaudente", which means "The pleasure Valley". 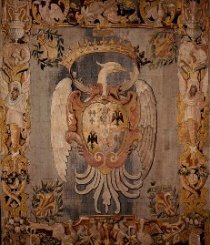 Ippolito II died, after a short disease in 1572, assisted only from his servants. In his last days, he was really disgusted by the plots laid against him and by the political affairs, which went badly for him. He was buried in the Church of Santa Maria Maggiore of Tivoli, near the Villa he had really loved.